Wednesday August 17th 1921 weather pleasant. I sewed some in forenoon. Cora to the store. I had a letter from Sister Ida and wrote her. I slept in afternoon. Hattie and I to Chautauqua in evening. 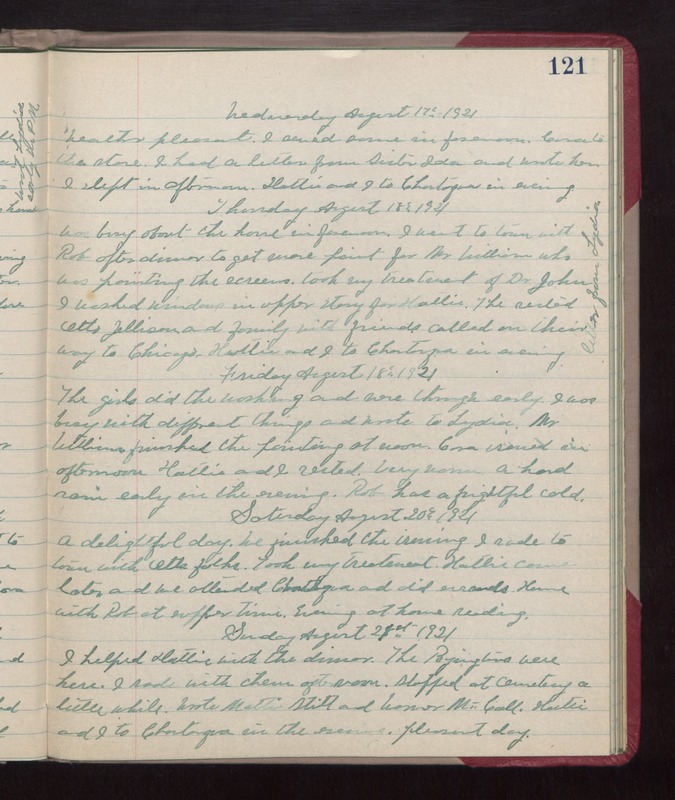 Thursday August 18th 1921 Was busy about the house in forenoon. I went to town with Rob after dinner to get more paint for Mr Williams who was painting the screens. Took my treatment of Dr John. I washed windows in upper story for Hattie. The rested. Otto Jelison and family with friends called on their way to Chicago. Hattie and I to Chautauqua in evening. Letter from Lydia. Friday August 18th 1921 The girls did the washing and were through early. I was busy with different things and wrote to Lydia. Mr Williams finished the painting at noon. Cora ironing in afternoon. Hattie and I rested. Very warm. A hard rain early in the evening. Rob has a frightful cold. Saturday August 20th 1921 A delightful day. We finished the ironing. I rode to town with Otts folks. Took my treatment. Hattie came later and we attended Chautauqua and did errands. Home with Rob at supper time. Evening at home reading. Sunday August 21st 1921 I helped Hattie with the dinner. The Byingtons were here. I rode with them after noon. Stopped at Cemetery a little while. Wrote Mattie Stitt and Warner McCall. Hattie and I go to Chautauqua in the evening. pleasant day.